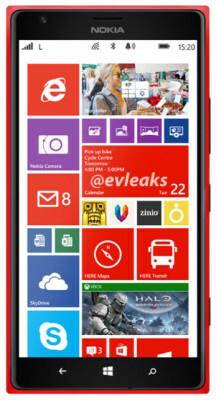 Nokia’s upcoming smartphone Lumia 1520 red makes apperance in new leaked pictures by @evleaks. The device will have high end specifications and a high price as well. The new Lumia 1520 is creating buzz almost from a month back. The official release / launch date of the handset is not revealed yet but it is expected to launch at Nokia World in Abu Dhabi on October 22nd. Nokia Smartwatch was also leaked yesterday. The handset would be powered by Snapdragon 800 processor with Adreno 330 GPU and 2GB RAM. It will have 6 inch Full HD display. It is expected to have 20MP pure View camera with Pro camera app. The company would also reveal a tablet on October 22nd. In mean time have dreams of the upcoming devices from the Nokia.